In 2015, wildfire burned over 10 million acres of land across the United States for the first time in recorded history. This was no anomaly: 9 of the 10 worst fire seasons have all occurred since 2000. 2017 is on pace to join the list with nearly 8.5 million acres burned as of September 17. Wildfires have been particularly vicious in the western U.S., choking Seattle with smoke, ravaging the renowned Columbia River Gorge, and threatening Los Angeles with the largest fire in the city's history. Forests are three to four times as dense as they were a century ago, with excess vegetation increasing the risk of wildfire. As a result, 40 percent of the U.S. Forest Service's 193 million acres of public forest and grasslands are at "high risk" of severe wildfires. Forest restoration—the strategic removal of brush and shrubs and selective thinning of trees—could help return forests to a healthier state. However, the agency is far short of the resources it would need to do to the job at the scale required. An ambitious new approach to financing is needed. One such approach, called the Forest Resilience Bond, will allow private investors to help close the gap between the need for forest restoration and the capital available for restoration projects. Forests restored to a more natural density face a lower risk of severe wildfire, which protects water quality and watershed resilience while avoiding devastating carbon emissions from wildfires. However, despite the financial, social, and environmental benefits that restoration would create, the USFS lacks the resources to implement treatments. That's due to a vicious cycle known as "fire borrowing," in which USFS pays to fight today's fires out of the funds designed to prevent tomorrow's. USFS now spends more than half of its budget just to put out fires. Left unchecked, fire suppression is expected to rise to two-thirds of the total budget by 2025, resulting in nearly $700 million less available each year for proactive restoration and other initiatives to promote forest health. Forest restoration generates positive impact and economic value not just for USFS but also for a wide array of beneficiaries. 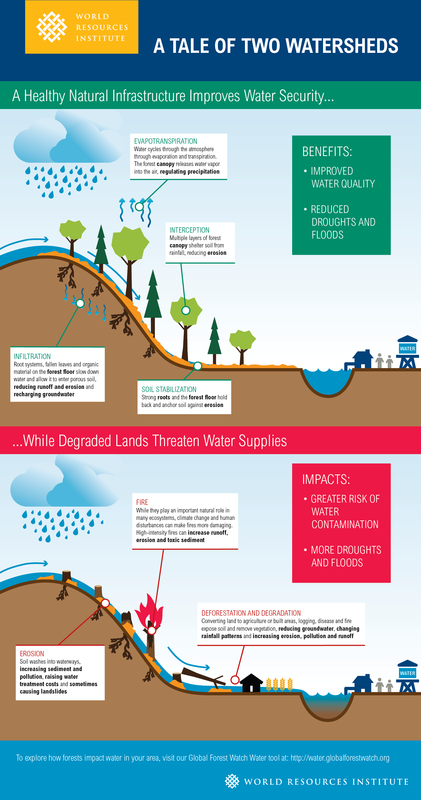 Water and electric utilities save money when there are fewer severe fires because trees and vegetation hold soil that would otherwise erode, contaminating and clogging drinking water systems and reducing hydroelectricity generation capacity. In places like California, where more than 60 percent of water originates in the forests of the Sierra Nevada, restored forests can potentially lead to additional water quantity for utilities. With the ideal amount of vegetation present, excess plants and trees no longer consume inordinate precipitation. 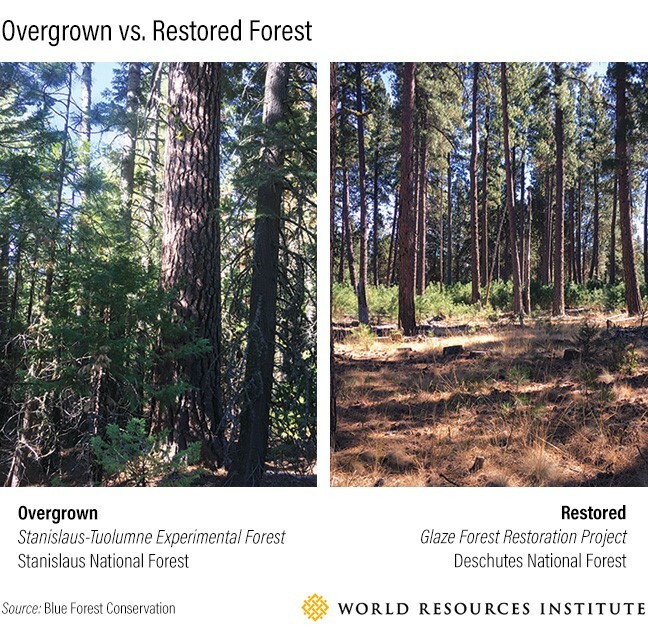 Restoration also allows state governments to protect rural communities while creating restoration-related jobs and avoiding dangerous emissions from severe wildfires. In many cases, the multi-stakeholder value of forest restoration far exceeds its costs and would make a compelling economic case for investment—if such opportunities existed. 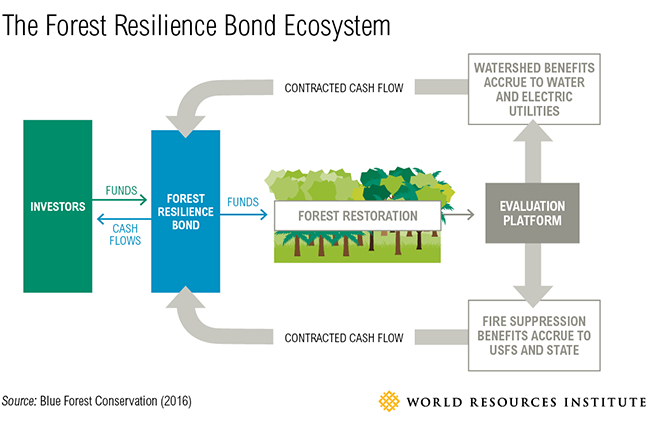 Recognizing this potential, a new approach called the Forest Resilience Bond has been spearheaded by Blue Forest Conservation, the World Resources Institute, and Encourage Capital. This first-of-its-kind tool brings together the beneficiaries of forest restoration with an unlikely ally: private investors. The Forest Resilience Bond (FRB) is an investment in forest health. It is a public-private partnership that enables private capital to finance much-needed forest restoration. Beneficiaries of the restoration work make cost-share and pay-for-success payments over time (up to 10 years) to provide investors competitive returns based on the project's success. State and local governments, paying for avoided fire suppression costs, avoided carbon emissions, protected communities, and job creation. Because there is a multi-billion dollar need for forest restoration across the U.S. ($6+ billion in California alone), the FRB presents an unparalleled opportunity for investors seeking stable returns and environmental impact and for USFS, state governments, and large utilities to sustainably fund restoration today to avoid future catastrophe and costs tomorrow. $52 billion is invested in global environmental conservation annually, but research shows at least six times that sum is necessary to preserve the world's ecosystems. The Forest Resilience Bond could help meet this challenge. In their inaugural report, "Fighting Fire with Finance: A Roadmap for Collective Action," the FRB team details how conservation finance can be applied not just to forest restoration, but to other environmental contexts across the globe. With fire seasons getting longer and more severe, relying on public funds to maintain forest health is increasingly unsustainable. Instead, collaborative approaches like the FRB represent an alternate path forward that redefines how conservation is funded. It may be too late for the 2017 fire season, but there is still hope for the tens of millions of acres in need. Investors Think They Can Make Money Reducing Wildfire Risk. A Forest Restoration Project in Yuba, CA Puts this Idea into Practice.